Loco 41315 shunting a Down freight train at Gunnislake Station in August 1954. 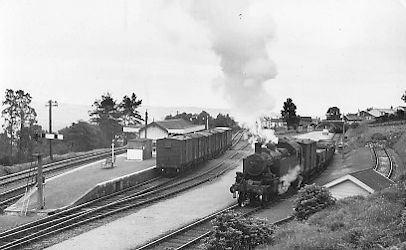 Gunnislake Station was opened by the Plymouth, Devonport and South Western Junction Railway Company on March 2nd 1908. The Station comprised an island platform which the public accessed by means of an underpass. It was the only point on the line where passenger trains were permitted to pass each other. In 1914,under the Plymouth, Devonport and South Western Junction Railway Company, the Station Master at Gunnislake Station was 43-years-old Mr Arthur Godfrey, who hailed from Ottery Saint Mary, Devon. According to the "The Official Hand-book of Station 1956" Gunnislake Station, which included Cocking's siding, Messrs Hill, Westlake and Company Limited's brick and tile works at Chilsworthy, the Ministry of Agriculture, Fisheries and Food's Chilsworthy Siding, Pearson's siding, Messrs Perry, Spear's Drakewall Siding, and Messrs J Westcott Limited's Sandhill Park Siding, dealt with goods traffic, passengers, parcels, miscellaneous traffic, furniture vans, carriages, motor cars, portable engines and machines on wheels, live stock, horse boxes, prize cattle vans, and carriages and motor cars by passenger or parcels trains. It was not equipped with a crane. It was closed to goods traffic on or as from February 28th 1966 and all but one of the siding accommodation was taken out of use on August 2nd 1966. The Branch beyond Gunnislake Station was closed on or as from November 7th 1966 and the track removed during June 1967. Gunnislake Station then became the terminus of the Branch line. The Down Loop and remaining siding were taken out of use on May 5th 1968 and trains used the Up Platform only. During the 1970s the station buildings were demolished and a shelter provided instead. A new Gunnislake Station, used by the present Plymouth Station to Gunnislake Station branch trains, was built on the site of the former ECMR Drakewalls Depot and opened in 1994.